Khortytsya Island is located on the Dnipro River in Zaporizhia. In the world are many places endowed with special sacred power. In Ukraine, one of these - an island Khortytsya, one of the energy centers of our country. 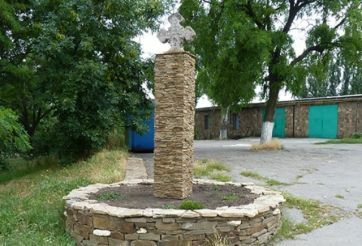 Being on Khortitse old, ancient buildings, shrines combine: Scythian burial mounds erected yet, perennial sacred oaks, Cossack shrines, pagan shrines and temples. The island is covered with a veil of mystery stories, the magic is still a place where going to the modern neo-pagans - to worship pagan gods. 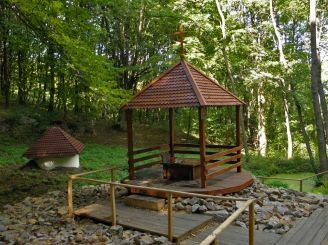 Built here their religious symbolism and-mortar Ukrainian Buddhists. This religious monument was erected so that is fully consistent with the proper construction of the Tibetan canon. The symbolism of the stupa is strictly defined, it consists of 5 members, which includes top and 4 sides. In nature, they embody a harmonious combination of space - the top, fire, water, air, land. 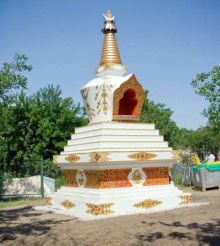 Buddhist stupa, a height of about 4 meters, was built on a private estate, just a week from 1 to 7 June 2009. Participation in the construction took a lot of people whose faith - Buddhism. They believe that to join the action of the stupa can touch her, and beating her on the path that passes the sun every day, exactly 108 times. From year to year the number of people coming to the mortar. Many people do yoga near her, believing that it gives them a positive health and strengthens the chakras of the body. Zaporizhzhya fans Buddha`s teaching welcome everyone to worship her, who come to this sacred to them the place. 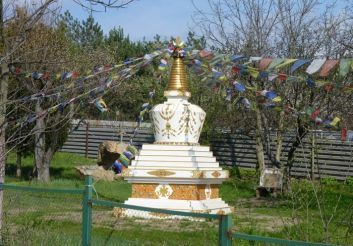 The positive impact of the first Buddhist stupas in Ukraine will be distributed throughout the region Zaporozhye. 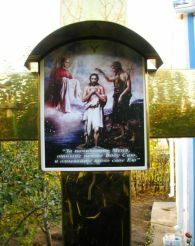 Buddhist cult building is located about a half-hour walk from the railway station Zaporizhzhya Sich.